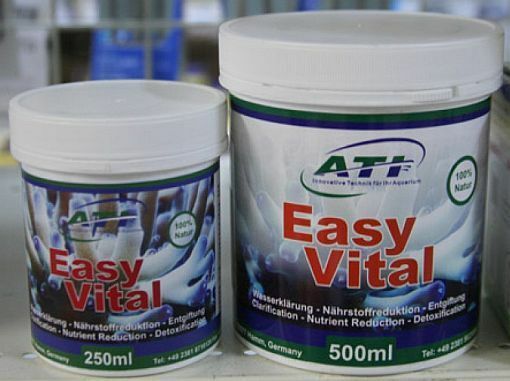 ATI Easy Vital water conditioner is a 100% natural, highly active clay mineral designed to condition and clarify aquarium water by removing harmful organic waste and bacteria. It does not contain any enzymes, bacteria or chemicals and is virtually harmless to an aquarium, even if it is accidentally overdosed. Removes organics, phenols and other waste to significantly reduce the dirty, yellow coloration of the water. Removes ammonium and ammonia, which in turn decreases the formation of nitrite and nitrate, removes chlorine, heavy metals, copper, zinc, cadmium, arrearages of drugs, and many other toxins. Helps prevent bacterial infections by reducing the amount of harmful bacteria in the water. The reduction of nutrients helps to prevent algae formation. The reduction of biologic retardants leads to increased coral growth and better polyp extension.